Congrats to Robbie Graham. She has landed a new gig as the VP of External Affairs for the University of Alaska. The title is code for chief lobbyist. You will probably recall Ms.Graham was working on contract for Mayor Ethan Berkowitz after oddly being let go by the Alaska Dispatch News for serving on Ethan’s transition team. Apparently, ADN people aren’t allowed to engage in even tangentially political events, unless they are the owner and the event is private. Fond farewell to Travis Smith, the Alaska Democratic Party’s communications director. Travis will be leaving at the end of the month for greenie-er pastures. Check back with us next week on where he’ll be landing. The big question for now is who do the dems hire to replace the meme master? The new Walker and Berkowitz administrations have sucked up a lot of their young communications pros like Myer Hutchinson, Nora Morse, Zach Fields, Katie Marquette, and Aileen Cole. My bet here is on an out-of-state hire. Go for it Marilyn. Sources around the west Anchorage legislative district now represented by Matt Claman tell me Marilyn Stewart is gearing up to run against him. You might remember Marilynn as the Director of the Office of Equal Opportunity at the city under Mayor Sullivan. She is the kind of smart, articulate, and uber professional woman of color that would seem to be a great fit for this moderate district. You can never tell how good of a candidate someone will make until they run, but I still feel her presence makes this a race to watch in 2016. Poor Karly Meyer, she started working at KTUU this week. She is interning for now, but Karly is the kind of smart, perky, and camera friendly personality that seems a perfect fit for an on air job so I’m sure she’ll be there in no time. Why poor her then? Because I feel bad that she will inevitably be subject to the same kind of vitriolic attack from radio host Dave Stieren that he launched on Aileen Cole. You see, Karly is the daughter of Senate President Kevin Meyer and works for KTUU and Aileen is the daughter of ADN writer Dermot Cole and works in the Governor’s press office. Mr. Stieren has made it loud and clear he finds these kinds of father-daughter relationships between elected officials or their staffs and the media inappropriate. I don’t see it, it seems like all four of these folks are highly professional so I’m inclined to think they can handle their job and family business just fine. Unfortunately Dave, being an intellectually honest and fair minded guy, and these situations being identical, will undoubtedly give the Meyers the same harsh treatment he gave the Coles. Sorry about that Karly. And the new Senate Majority Press Secretary is……well, we don’t know. It seems Senate President Kevin Meyer is taking a deliberate approach to the hiring. I’m told they have done several interviews and will do a few more before weeding down and doing second interviews. You will remember the Senate Majority’s hiring of pocket square aficionado McHugh Pierre in January ended with a minor scandal and his departure. Then the employment of their chief spokesman Carolyn Kuckertz ended in embarrassment in June after her arrest on hit-and-run charges. You can’t blame Meyer for taking his time on this one. Get Some. On August 25th the Senate Majority held their big fundraiser at the Crowne Plaza. In attendance were senators Lesil McGuire, Bill Stolze, Kevin Meyer, Charlie Huggins, Anna MacKinnon, and Cathy Giessel and staffers Akis Gialopsos and the lovely Suzanne Armstrong Cunningham (Sorry, Suzanne). Lobbyists Sam Kito Jr, Jerry Mackie, and Kris Knauss stopped by. I am told the hot topic of conversation was what conservative voice Casey Reynolds is working on. We’ll let you know if they figured it out. I hear they raised $30,000. Get A Wee Bit Less. The very same night the Dems gathered across town at the home of former US Senator Mark Begich for their Women of Distinction event to honor Carol Cuomo, Bettye Davis, and state senate candidate Hilary Morgan……Oh, and raise money to elect dems to the state senate. I hear over 200 came and the house was so packed people couldn’t get in the front door, as Sam Kito Sr. can attest. Notable in attendance were Bill Popp, Harriet Drummond, Geran Tarr, Forrest Dunbar, Andy Josephson, Eric Croft, the three women of distinction themselves, and of course homeowner Mark Begich. Lobbyists Jerry Mackie and Kris Knauss had a busy night as they made an appearance at the dem fundraiser and then sprinted over to the GOP one. Word is the dems raised $25,000. Bless His Heart. The next night was the campaign kickoff and fundraiser for man-about-politics and republican state senate candidate Jeff Landfield. It was a sparsely attended event of 15-20 people. Jason Brune made it, as did Sam Moore. I’m sure those who went had a memorable time, I mean after all, it was a #highlevelmeeting. So Close. So the President came and went, and I’m sure you’re tired of hearing about it, but here is one last morsel. When the President arrived at the Dena’ina Center he was scheduled for a grip-and-grin with local VIPs. In the room eager to get their pic with POTUS were Les Gara, Tony Knowles, Neil Foster, Kay Brown, Mark Begich, Jim Whitaker, Byron Mallott, and the list goes on and on with adoring democrats. But who do you think was in the front of the line? I’m told it was our brand new U.S. Senator Dan Sullivan and his family. I hear the coy Sullivan, who didn’t get any face time with the Prez while he was in Alaska, tried a sly move by sneaking in some policy talk at the photo op. The story goes that Obama, who undoubtedly has been through this a few million times, snubbed the policy chit-chat and sent the junior senator on his way. Well you can’t blame a guy for trying. Tough Choices. 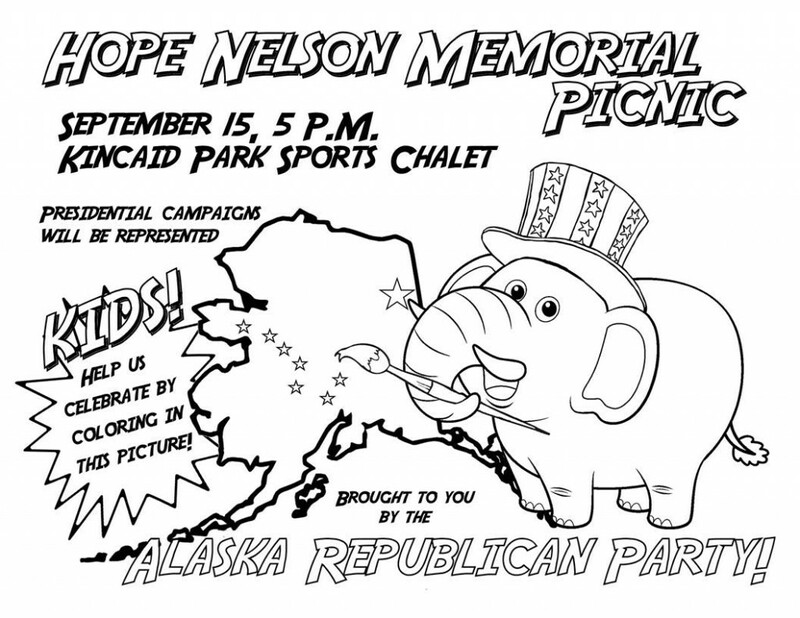 Tuesday night the republican faithful will make their yearly pilgrimage to Kincaid Park for the annual party picnic. This year we a re promised the presidential campaigns will be represented. My oh my, I hope the chalet out there is big enough for all of them. The bigger problem for organizers is dems may have unwittingly given many good conservatives quite the scheduling conundrum. It turns out the Anchorage Assembly has scheduled public testimony on the new gay rights ordinance for the same night, at the same time, clear across town. Errrr, what is a good republican to do? I’m guessing the assembly meeting, which actually matters, wins for many. 1 Comment on "Friday in the Sun"